SimpleCart is an e-commerce solution built for MODX Revolution. It uses standard MODX tools to let you build a fully-functional shop and checkout with full creative freedom. Now part of the modmore family. SimpleCart works great with existing tools and extras such as FormIt and ContentBlocks. SimpleCart products are managed as custom resources, so you can use extras like getResources, getRelated, and Wayfinder to build the front-end functionality you need. All output can be tweaked through chunks, offering lots of creative freedom. Start accepting payments right away with our free payment gateways for PayPal, Mollie, Stripe and Authorize.net payment providers through free installable packages. Or use the built in Bank Transfer method to handle payments manually to just use SimpleCart as, well, a cart. SimpleCart comes with rule-based taxes, so you can apply Sales Tax or VAT to orders. Set up different tax rates for entire categories or individual products. 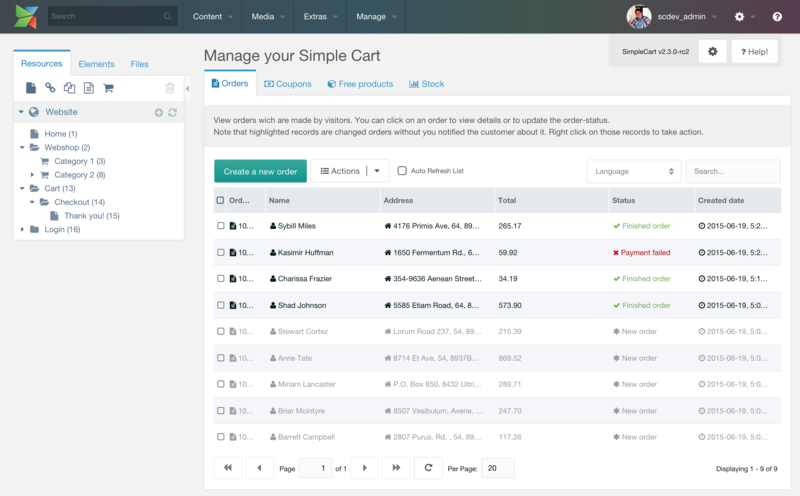 For categories and products, SimpleCart has custom resource types to make managing your products simple. While still resources under the hood, the interface has been focused on the products. SimpleCart powers hundreds of webshops around the world. The feature complete SimpleCart Manager pages contain all the information you need to fulfil orders and to manage your shop. Not sure what to do or where to get started? The Help button in the top right of the screen will immediately show you the relevant documentation for the tab you have open currently. In the main list of orders, you can see the most important information at a glance. The order number, client and their address, the order total, the status and the created date. This table supports bulk actions, so you can select multiple orders and use the Actions menu to export orders or remove orders. From the back-end, you can also easily create new orders. Provide the customer information and add products to add it to the list. While you can manage a lot of things in the default view, there are even more options in the administrators panel. This contains things like order statuses, delivery and payment methods and tax rates and rules.